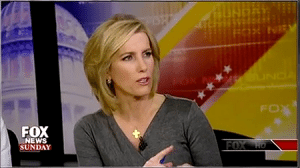 Laura Ingraham names names. Bob Goodlatte, Mario Rubio, Paul Ryan and others as being partially to blame for the mess we have now at the border. They, along with others such as John Boehner and the twin RINOs from Arizona, McCain and Flake, as well as Lindsey Graham refused to take amnesty off of the table, and therefore facilitated the continued discussion and the possibility. She hammers them for their part in allowing the Central Americans to believe that they were going to give this gift to Obama, not to mention the chambers of commerce. She said it didnâ€™t happen because the people rose up. Ingraham also mentions the Eric Cantor defeat as playing a role in their change of heart, an effort in which Ingraham played a significant role in helping to engineer his defeat. She doesnâ€™t mention it but deserves credit and our thanks for her contribution to that cause. She also notes that the Republican politicians are now seeing the Gallup polls and recognizing that it is political suicide to be on the side of the pro-amnesty socialists at this point.